The scientists had analyzed several thousand blazes in Siberia from 2006 to 2014. Researchers from the Siberian Federal University (SibFU) and the Russian Academy of Science’s Laboratory of Forest Monitoring at Institute of Forest have succeeded in estimating the heat release rate of wildfires burning in the Taiga (boreal forests) using infrared satellite imagery measurements. The study was aimed at developing a method for detecting crown fires and fires of extreme intensity in order to forecast the characteristics of the blazes and the severity of their exposure to forests, to refine the global estimations of carbon dioxide released into the atmosphere, and to model the damage to the forests. The scientists had analyzed several thousand blazes in Siberia from 2006 to 2014 according to the data received from the TERRA/MODIS satellite of NASA. The conclusions made by the team of researchers are not comforting. The assistant professor at the Chair of the Ecology and Environmental Management and the Chair of Thermophysics of SibFU, Evgeny Ponomarev claims that lately, wildfires in Siberia have been cropping up on a more frequent basis. In addition to this, the rate of crown fires and fires of extreme intensity have grown, with the most important reasons being the impact of human activities and a changing climate. When speaking about the scale of Siberian fires, Ponomarev has drawn a parallel between the blazes and thermal power plants (TPP). "The heat release of an extremely large wildfire is comparable to the heat capacity of TPP. For example, if a forest fire encompassing more than 50,000 hectares is burning, the energy released from it is equal to the energy produced by Krasnoyarsk TPP-1 which is capable of supplying about half a million of habitants with electricity and heat," the researcher explained. According to the collected data, the rate of such conflagrations in some cases reaches 15 percent of the mid-year value. 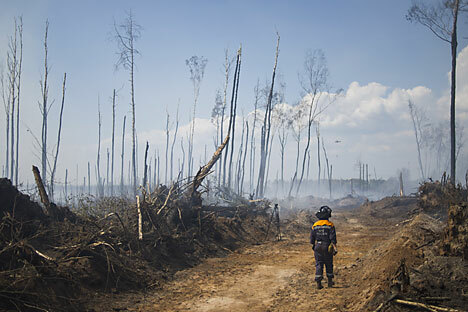 In total, up to 17 million hectares of forests are ablaze in Siberia annually.